So you want to be a Samurai? Then prove your worth. Because you are a Samurai and there’s an army coming to knock down the doors of your village and burn it to the ground. 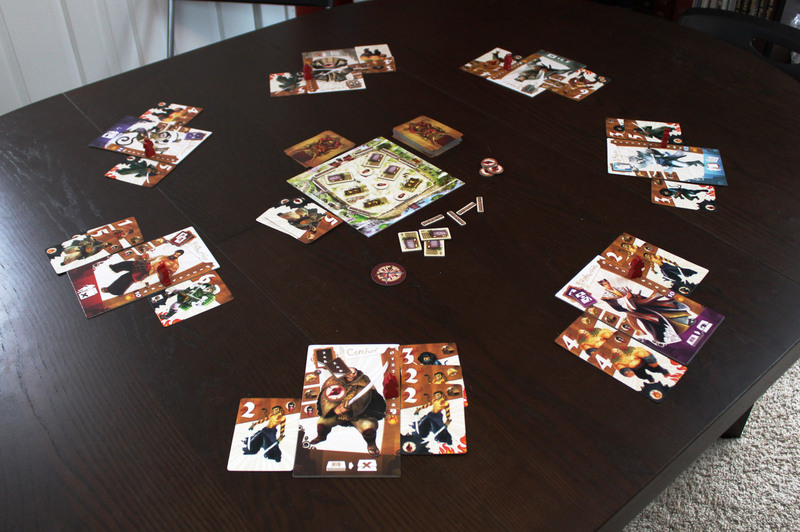 Based loosely on the film Seven Samurai, Samurai Spirit is a cooperative game that pits you and your friends against a massive onslaught of opponents, and only you can stop them. Get ready to unleash the spirit animal that lies within you, because the odds are overwhelmingly against you, and only the fiercest will survive to save a remnant of their land. 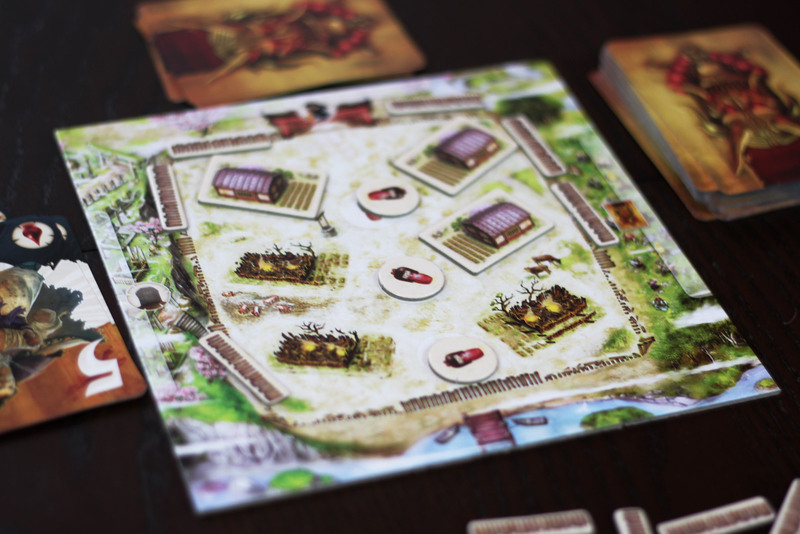 Samurai Spirit is a cooperative game in which players must defend the village against an enemy invasion. Players must survive three waves of increasingly challenging armies and save a remnant of the village in order to achieve victory. 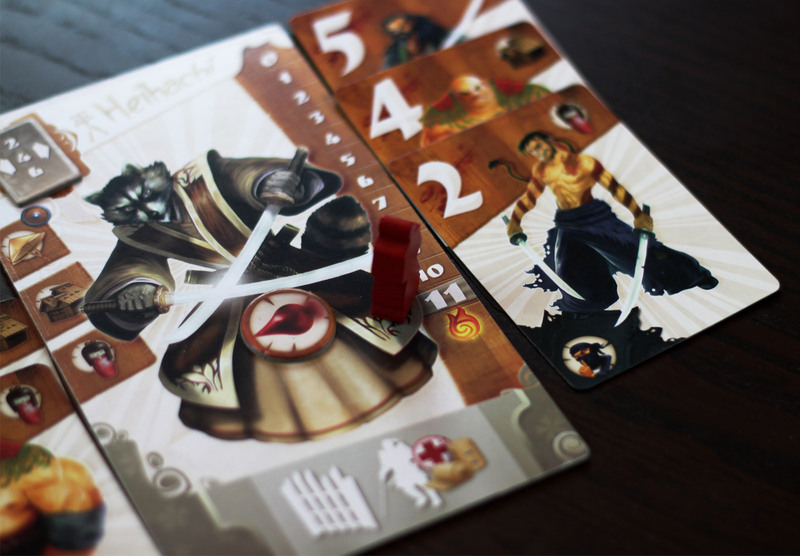 Each player controls a Samurai with a Talent, a special Kiai power, and a certain combat level. Players take turns, and each turn you are faced with a choice of 3 options: fight, support, or pass. If you pass you’re out for the rest of the round. Support: Without looking at it, place the card in the Invader pile face-down. 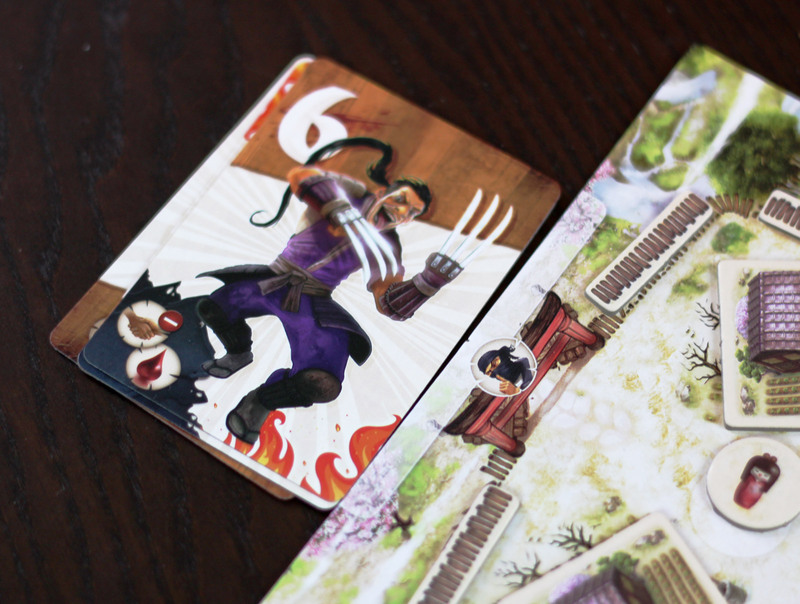 Those cards will later attack the village, but you can then share your Talent with another player for their one-time use. 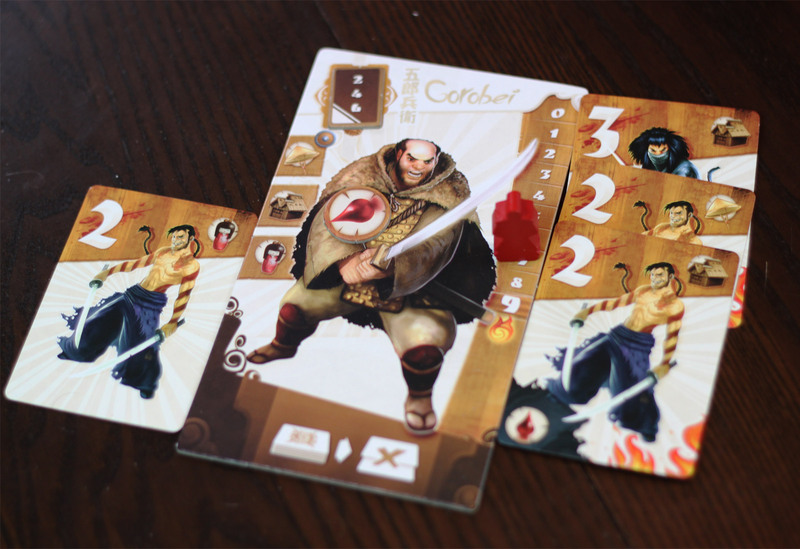 Confront: Add the card to your battle line on the right side of your player board. Update your combat track to equal the total value of enemies there. If your Battle Line ever exceeds your maximum, one damage is dealt to the village and you’ll be forced to pass on your next turn (unless you can somehow increase your combat level or get rid of some cards). At the start of your turn, you suffer any penalties showing at the end of your Battle line. 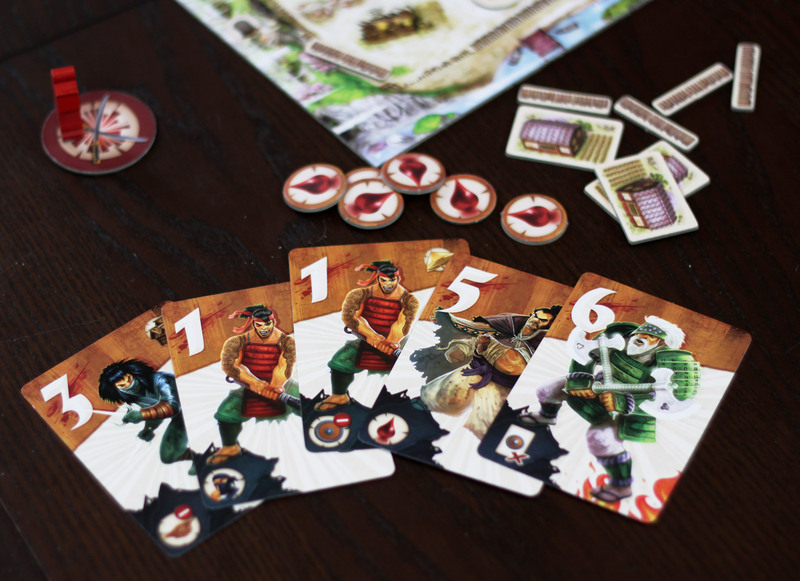 This may include damage to the village, taking a wound, being unable to defend, being unable to support, or forcing another player to add another card to their battle line. At the end of the round, any undefended symbols do damage – hats deal a wound to the player, farmhouses and villagers undefended remove 1 token of their respective types. If there is at least 1 Farmhouse and 1 Villager left, you get to go on to the next round. Doin’ battle. Day in the life. Each player has a Talent that is always accessible. Talents include optionally passing certain card numbers or ignoring negative effects in the battle line. Others allow drawing extra cards or discarding cards under certain conditions. As mentioned above, when you Support you can share your talent with another player. Any number of talents can be given to a single player, although shared talents can only be used once before being passed back. Players always maintain their own talents, and when applicable they can be used out of turn. Kiai are much more powerful abilities that have to be unlocked. In order to activate your Kiai you need to fill up your Battle Line to its exact maximum. Different Kiai can remove enemies, repair the village, and even heal your allies, among other things. 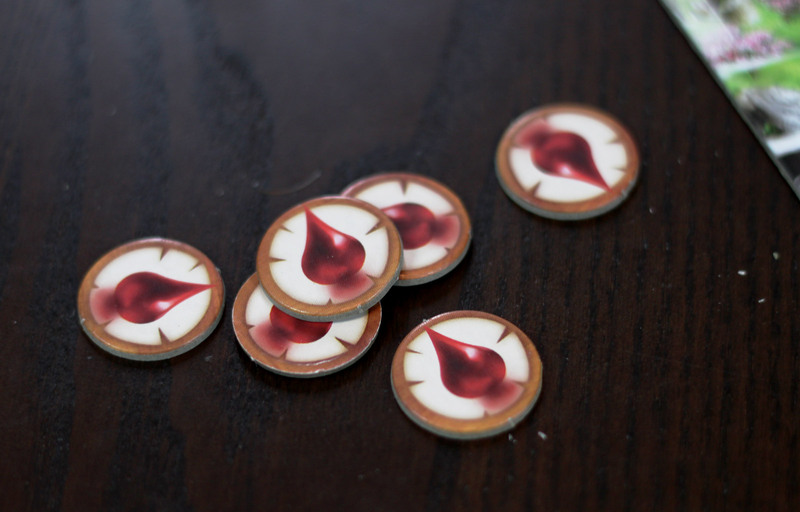 Each player can sustain 3 wounds before being killed. However, if you receive a 2nd wound before being healed, you go into “BEAST MODE” which increases your Kiai power as well as the length of your Battle Line. You can never go back to human mode, so taking 2 wounds in Beast Mode will send you to the grave. You also lose if all of your Farmhouses are destroyed, all Villagers are killed, or if one player is killed. You only win if you all survive 3 rounds with a least one villager and farmhouse still in play. Spirit of Victory, or Convulsions of Defeat? 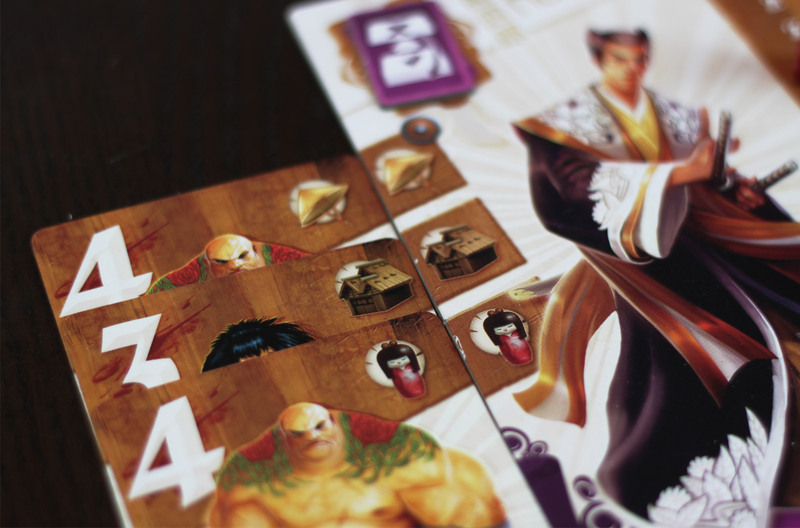 Samurai Spirit is a fairly unique sort of co-op game. In a way it’s like a cooperative version of Blackjack, with much better art and a few special powers thrown in the mix. But that’s what it really boils down to in a sense: trying to hit a maximum total card value without going over. Of course in this game there are a lot of side paths to manage and/or utilize, and scoring the “blackjack” isn’t the end goal. The game puts the emphasis on the overall strategy between all the players, rather than efficient individual player turns. On your turn you have very limited choices – you draw a card, you have to put it somewhere, and it takes a bit of luck to get the exact number and symbol you need later in the round. Early on, your choices don’t at first seem to have much weight – everything is open, and you can’t exactly predict which cards you’ll draw later, so you don’t know for sure to defend or confront. Certainly Supporting seems like a waste. Near the end of the round, your options become very limited, and it requires a bit of luck to get the exact cards you need that either match your missing Defense symbol or can get added to your Battle Line without knocking you out of the round. Unlock your Blackja- I mean, Kiai! Unleash your Kiai! So, it’s easy to see why some people see this game as entirely luck-oriented with very little player choice. It’s just draw a card and play it and hope it doesn’t kill you. Or is it? Truthfully, I think the game is more than that. That isn’t to say that luck isn’t a big factor – like I said, it’s basically Blackjack with special powers – but while the excitement of Blackjack comes from pushing your luck and playing the long game by paying attention to the cards in play and knowing your odds (made even more thrilling by the inclusion of money), the excitement of Samurai Spirit comes from… pushing your luck and playing the long game by knowing your odds. You see, Samurai Spirit is stacked against you. If you just play each turn as it comes to you, you lose the game. It’s not even really luck at that point; it’s simply set up that way. If you just keep drawing cards, you’re going to bust. If you play it too safe, your village is dead. It’s like an invasion. If you don’t go out and fight and try to come up with a battle plan, your village is crushed anyways. As a result, it becomes about studying the big picture. It’s almost a puzzle to solve – how can you take this unknown sequence of cards that will definitely kill you and, using your somewhat limited Talents, manipulate that sequence to scrape away a victory? These fellahs don’t want you to win. They want you to lose. The challenge level is quite high. You rarely know with 100% certainty what’s coming next. Especially in the first round, when the mix of cards is unknown to you. Still, the first round is the easiest – no one is wounded, you have fewer cards to deal with, and they’re all lower numbers. You have a decent chance of coming off with very minor wounds. If you pay attention to the cards that come into play, you have a better chance of knowing your odds in the second round, when you’ve seen all the cards already. It’s not easy and again, there are no guarantees (at least not without the use of certain powers) so you still might push your luck and come up, y’know, dead. However, from the wide angle lense, it becomes fairly impressive what you can do with the game board and the cards you are dealt. Everyone has to work together to figure out what Talents to pass to whom, so that you can pull off the big play that will secure your victory. Sometimes you see a sequence of actions that will set up a certain player for almost guaranteed success (in other words, to unlock their Kiai), and you do it, and it feels awesome. It’s those moments that the game is all about; that’s what makes the game interesting and engaging. You’re studying the table, the cards, the other players, and looking for that big opportunity. You’re not going to have that every turn, so you have to snap it up as soon as you see it. In the meantime, there are plenty of smaller victories to be had. You’ll see a player about to die and then figure out how to save them. You’ll figure when to let a the hurt happen, and how to cover up a negative effect that would be devastating. You’ll be passing and manipulating cards and taking risks. They won’t always pan out, but you can certainly have fun in the meantime. I haven’t yet won this game with a full group (between 4 and 7 players) and while the game is playable with 2 or 3, it seems a lot easier and not quite as interesting. The fun is in figuring out how and when to pass a bunch of Talents to the right person, or how to save the guy 3 turns from now, and you need at least 4 players for that to become a dynamic experience. I do think the amount of luck involved will be frustrating to many people; it’s so hard to control what happens next and even if you get a bunch of Talents to the right person at the right time, they might not draw the right cards. There will be points in the game that feel completely out of your control, like you’re just plodding along watching it happen to you. You can’t see what’s coming next much less do much about it. But again, it’s more about the big picture, the overall puzzle, and if you think of it like that the game will be a lot more fun. Defend yourself! And the village! And the people in the village! At the very least, the game is beautiful to look at, with heroes and villains alike beautifully illustrated. The colors are warm, the icons are clear and visible, and of course you want to go into Beast Mode simply because your guy looks pretty awesome when you do. The game is inspired by the movie Seven Samurai, an old Japanese adventure film featuring, y’know, seven Samurai defending a village from bandits. I don’t really know where beast mode comes from, but the characters are named after each of the samurai from the film. So, that’s a neat little thing, but it’s also why you won’t find any female samurai characters on the table. Anyways, moving on. 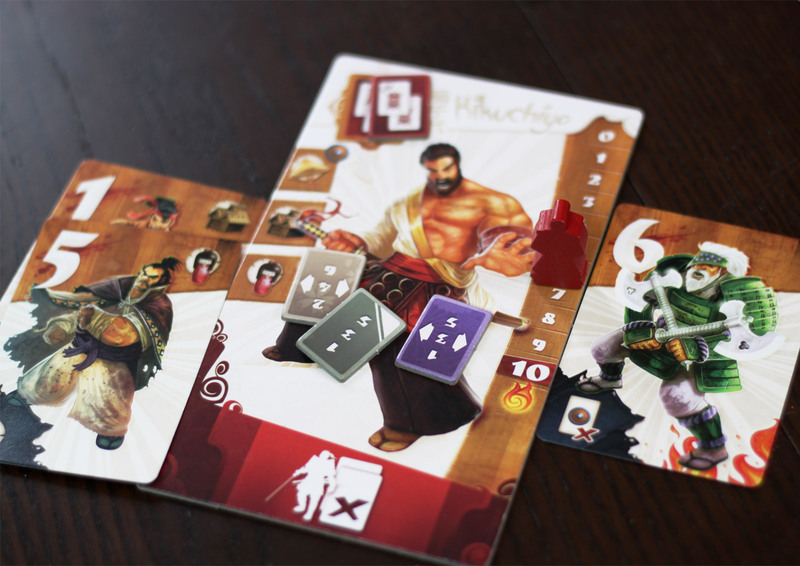 Is Samurai Spirit the masterpiece of designer Antione Bauza? Hardly. 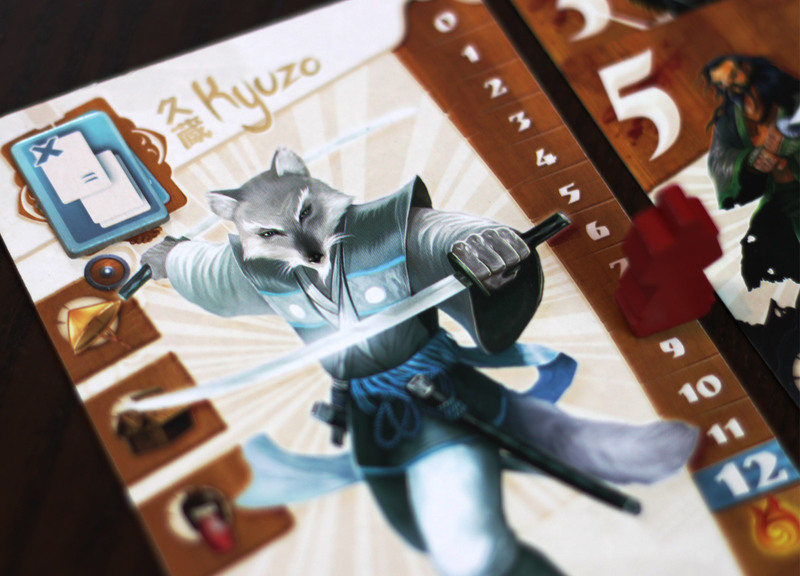 It’s hard to stand up to great games like 7 Wonders, Takenoko, or Hanabi. But it’s not a dud either. It’s an interesting, unique take on cooperative games that forces players to use limited tools to overcome massive odds. It’s a fun puzzle to try and solve, and it’s a beautiful game to look at while you play. The game doesn’t take too long to play either. I’d recommend trying to play with at least 4 players, 5 or more if you can. Really with 7 it’s the best, the most fun, the most energizing. If you get the chance, I say, give it a try. 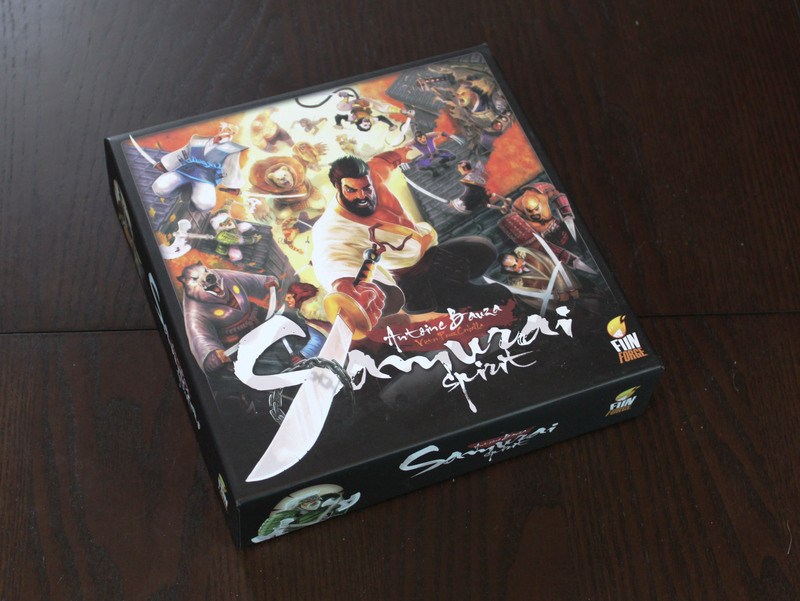 iSlaytheDragon would like to thank Passport Game Studios and Funforge for providing a review copy of Samurai Spirit. The theme sounds great but the lack of diversity is dissapointing. I get that it is ‘inspired’ by the movie (I’m guessing royalty free), but if they can have a samurai turn into a raccoon or a panda then I think they could make 3 of the 7 samurai female. Are any of the villains female at least?